Complete Medicinal Herbal is a fully illustrated practical guide to the healing properties of herbs. 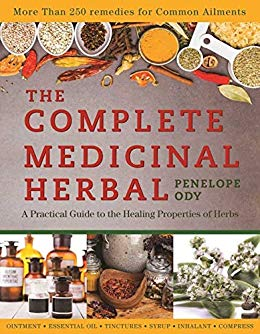 The book includes more than 120 medicinal herbs with important therapeutic properties and a section on their historical uses, The Complete Medicinal Herbal is a must for every home book shelve. All the parts of the plants that can be used medicinally are shown, from fresh flower petals or leaves to the root, bark, and juice. Each entry details the plant's chemical constituents, its actions, and its therapeutic applications—from exotic ma huang, used in China to treat asthma for 5,000 years, to humble cabbage, which has been effective against stomach ulcers in clinical tests. A special how-to section explains the preparation of herbal remedies. There are more than 250 safe treatments to help alleviate common complaints—from ordinary coughs, colds, and headaches to special treatments for skin conditions, digestive problems, and children's illnesses — even detailed lists of herbs for the elderly.